The first time I saw Dr. Michelle Durán, she was on stage at the Texas Distance Learning Association (TxDLA) conference dressed in a crazy costume and energetically encouraging attendees to have fun by participating in all of the entertainment activities. Her exuberant personality lit the stage and I knew she was someone I would love to hang out with! Then, I met Michelle one-on-one. Wow! I soon got to know her as a brilliant fellow educator with a serious commitment to raising leaders in distance learning. Many have taken notice of her contributions to the field. This year, in fact, Michelle received recognition for her efforts as the recipient of the USDLA Outstanding Leadership Award. I have known Michelle for over a dozen or so years now through our work together as board members of TxDLA and through professional activities related to distance education. 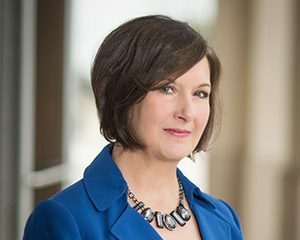 Michelle currently serves as Board Chair for the association while being employed as Assistant Vice President for Teaching and Learning at Texas A&M University, Kingsville (TAMUK). Under her positive and charismatic leadership, the distance learning program is thriving at her university. A few years back, I was invited to speak to faculty members at her university in a full-day DL summit. To see her work and impact first-hand was exciting. Her entire team shows the level of commitment and enthusiasm that Michelle exudes. Together they are instrumental in fostering a culture of innovative teaching and learning at TAMUK. Through her mentoring and leadership, Michelle has built a strong and unified team who are greatly serving their institution as well as working collaboratively in associations. Dr. Durán and her team have applied this same energy and enthusiasm cultivated at Texas A&M Kingsville to serve with TxDLA. For many years serving on the executive leadership team of the TxDLA, Michelle has consistently mentored, shared and collaborated with others internally and externally. She leads in a way that draws others to serve by strategically mentoring and encouraging future leaders. Her service reflects a strong commitment to the advancement of distance learning. Michelle is sought after for keynote presentations at regional and national conferences on topics of innovative learning spaces, pioneering distance learning practices, effective managerial strategies, and inventive digital learning approaches. She uses her breadth of knowledge and creative approaches to help solve education problems. Her entrepreneurial spirit contributes to her recognition as an innovator in the use of technology to meet the needs of learners at all levels. Just attend one of her sessions if you ever have the chance. You will be engaged from the beginning. Dr. Durán currently serves as Board Chair for TxDLA, Chair of the Texas A&M University System Council for Academic Technology and Innovative Education, Vice Chair of the Learning Technology Advisory Committee for the Texas Higher Education Coordinating Board, Managing Editor of the TxDLA Journal of Distance Learning, Chair of the South Texas Higher Education Regional Council, and is an active member in multiple additional professional associations and committees. Michelle has been and is a true leader in the development and acceptance of distance learning around the country. Not only has this led to her being recognized for the Outstanding Leadership Award, Michelle has been elected to the USDLA Board of Directors. I expect her energetic and exuberant personality combined with passion for serving and her knowledge and expertise in the field will greatly serve USDLA. USDLA is proud to honor people like Dr. Michelle Durán who are outstanding leaders with a heart and passion for distance learning. If you know someone deserving on this honor, I hope you will consider nominating them when it is time for nominations in the next few months. With great leaders like Dr. Michelle Durán, we can all rest assured that the future impact of distance learning is in good hands.